While tending the garden last evening I encountered a fledgling pigeon hopping around on the ground. He could fly -- but only about six inches before each crash landing. My first concern was that he'd be easy prey for the neighbor's cats, which hunt in our yard. 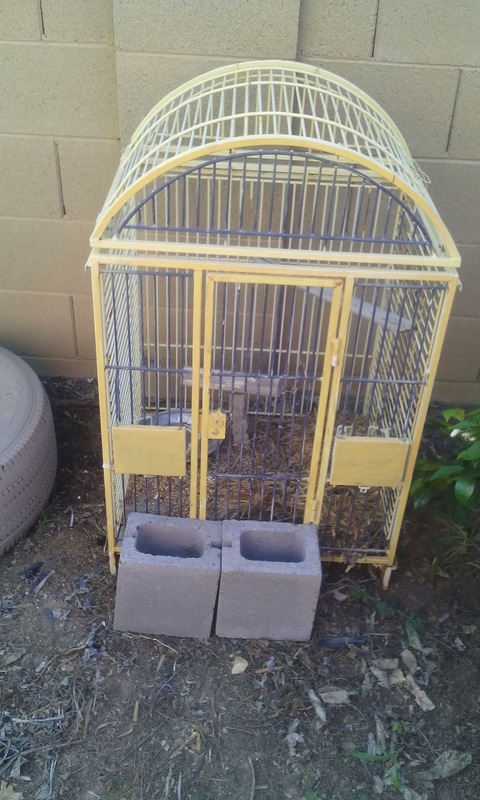 So, with the best of intentions I easily captured him and jailed him in a large bird cage that my neighbor Al gave me a few weeks ago. (I plan to paint it and fill it with potted plants.) Even though the lock on the cage doesn't work it is heavy duty and very secure with two concrete blocks wedged in front the door. I gave the bird a pan of water, some seed, and a handful of straw. Then I covered the cage with an old bed sheet to help keep him warm in his first night out of the nest, which is in the eaves of the house about eight feet away. This morning I went to the garden to free him from protective custody -- but the jail was empty! The sheet had been jostled. However, the blocks securing the door were still in place. There was a small blood stain on the wood floor in a corner of the cage. 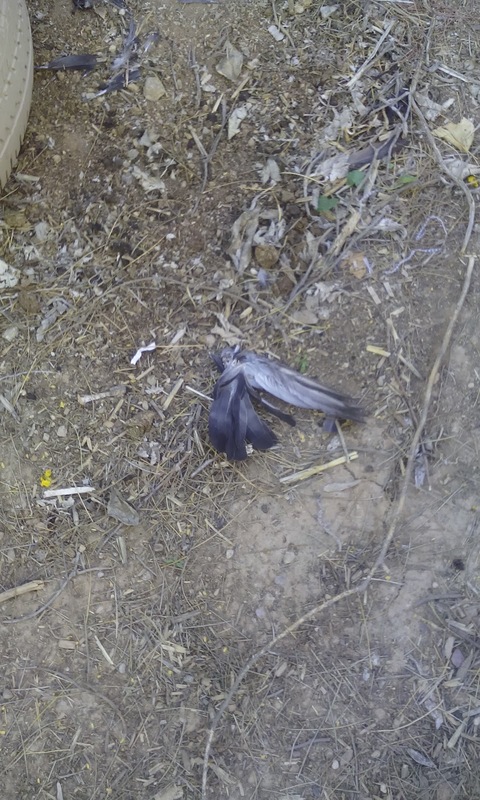 Assorted gray pigeon feathers, along with a portion of a wing, littered the ground about a foot away from the cage. I've concluded that my attempt at protective custody failed. But I don't know why. There is no way that he could have gotten out on his own. 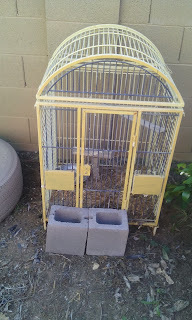 And there is no way that a cat maneuvered into the cage -- unless the feline also returned the two 20 lbs blocks to their exact position in front of the door after gobbling up the young pigeon. I wonder if a small snake squeezed in between the heavy duty bars. But if a snake ate the bird in the cage, how could the reptile, with its expanded girth, get back out? And why were there feathers outside the cage?